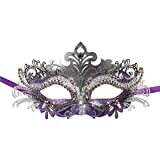 Purple Masquerade Masks On Sale! Main Material: Metal and plastic with rhinestones. Size: One size fits all, for women, girls. And this evening prom mask is carefully hand-made with high quality eco-friendly materials. Unique Design: Filigree metals are soft and bendable so they can be easily adjusted to your face. Instead of elastic bands, we use ribbon ties which allows you to adjust the mask to your head depending on your preference. You will feel very comfortable even won't notice that you're wearing them. Application: Its rhinestone embellishments will make you stand out as it sparkles when it catches light. 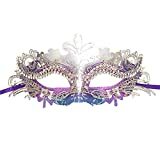 You always need sparkle when dressing for a feast, masquerade, Halloween/Christmas days, fashion shows , wedding,mask events , night club, carnival themed parties and costume parties. Style: Be the envying of the party when people see you wearing our glimmering and exquisite filigree Venetian mask. Intricate and delicate design combined with high quality materials makes our Venetian filigree masks fit for royalty at an affordable price.Stand out with our amazing colors, you will definitely gets lots of attention.